us a' free maister gairdners). This lodge took a leading role in opening Grand Lodge in 1849. Several Penicuik men became leaders of the organisation. 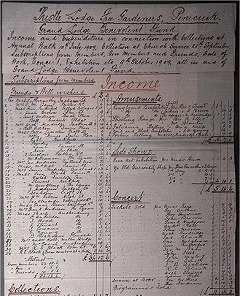 Penicuik contributed to the Grand Lodge Benevolent Fund many times by raising money from events, such as concerts. 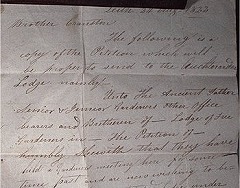 Despite participating in the Order, the lodge became a friendly society in 1874, from which time it was registered. Audited annual accounts have survived from this period. 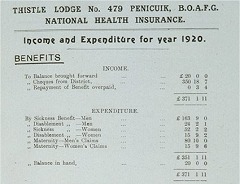 Benevolence was the most important aspect of the society's finances, but its day to day running and payments to the Grand Lodge were also significant. Continuing its tradition of seeking the best deal for its members, the lodge took a new path in 1912. In 1911 the Liberal Government, under David Lloyd George, introduced a scheme that provided for the elderly, unemployed and sick. 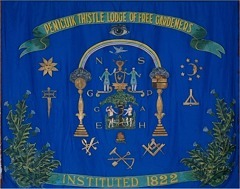 Prompted by this change, Penicuik Thistle Lodge affiliated to the British Order of Ancient Free Gardeners, East of Scotland District in order to participate in the National Insurance Act. However, it maintained its 'craft' links with the Ancient Order. Members could join simply for benefits (the friendly society) or for the non-statutory pleasures of the craft. The lodge's participation in public life in Penicuik became one to the traditions of the town. Each year, usually in July, the lodge paraded through the main streets led by a costumed character, 'Old Adam', and a number of 'Virgins'. 'Buskits of floo'ers' were carried by some members - the best won a prize. Families of members played a part in the celebrations, joining in dancing on the green of Penicuik House and other related events. The day's festivities were always reported in the local press.